Nest removal, also known as nursery clearance, is a highly effective way of controlling individual gull problems while also keeping the overall gull population in check. It also deals with much of the debris left behind by nesting gulls- so it gets right to the heart of the issues that these pests cause. Gulls are territorial birds. This means that they will build their nests in the same spots each year, so even a small infestation can balloon into a much bigger issue as time goes on. To have any hope of dealing with gull problems, you will therefore need to get to the very heart of the matter- and that involves stopping them from adding new generations to the overall gull population. Rather than just taking the eggs, nest removal involves collecting up every last trace of the gull nest. When the gulls return and find their nests gone, they will get to work on building another one to replace it. This takes time and keeps the gulls occupied so that they don’t cause any more trouble in the meantime. We then return to the nesting site approximately 5-6 times throughout the nesting season to repeat the process. Gulls are particularly stubborn birds, but even they will eventually concede that they have been beaten. If they have no luck with nesting for the whole season, then they will almost always give up on that particular site and move on to another area. So, not only does gull nest removal tackle the short-term effects of an infestation, but it also provides long-term gull population as well. It is important to note, though, that gull nest removal should only be carried out by trained professionals. As with virtually all animals, there are strict laws governing the treatment of gulls, so you can’t simply go up a ladder and clear the nest yourself. Not only may you be breaking the law by doing this, but you could also end up inadvertently provoking nearby gulls into attacking you. Instead, you should let the experts at Pest Solutions take care of the matter for you. All of our technicians are trained to the highest standards and possess all the necessary qualifications to work safely at heights. They can ensure that the nest removal is carried out humanely and without causing any harm to the gulls themselves, and we space out our visits to have the maximum impact on your gull problem. When is Nest Removal the Best Option? Nest removal is often a more practical approach in areas with a lot of guttering. With egg removal, the nest itself is still left behind. Debris from these nests can easily make their way into gutters and clog up drain pipes. A gull infestation is enough of a problem to deal with on its own, without having to also sort out a blocked drain, so it is best to just stop this issue from arising in the first place. On the other hand, nest removal not only clears all the existing debris, but it also catches any issues before they become a larger problem. While they are up there, our technicians will ensure that your gutters are kept free from debris, and since we check each site regularly, there’s no risk of any long-term issues developing. To find out whether or not gull nest removal is the best approach to take, Pest Solutions are happy to carry out a completely free, no-obligation survey on your property. We will come out to your home or a business at a time that suits you, and perform a thorough analysis of the pest gull problem at hand. That way, we can create a tailored plan of action that will deliver the best possible results. This will also allow you to witness first-hand just how professional our pest control technicians truly are. Get Rid of Those Gulls Today- Call Pest Solutions! If you don’t deal with a gull infestation effectively, then they will continue to cause a nuisance for a long time to come. Instead of allowing this to happen, call in the pest bird control experts at Pest Solutions for a professional approach to gull control. Just call Pest Solutions today on 0800 027 2555 to arrange your free survey, or to discuss your options with one of our expert technicians. 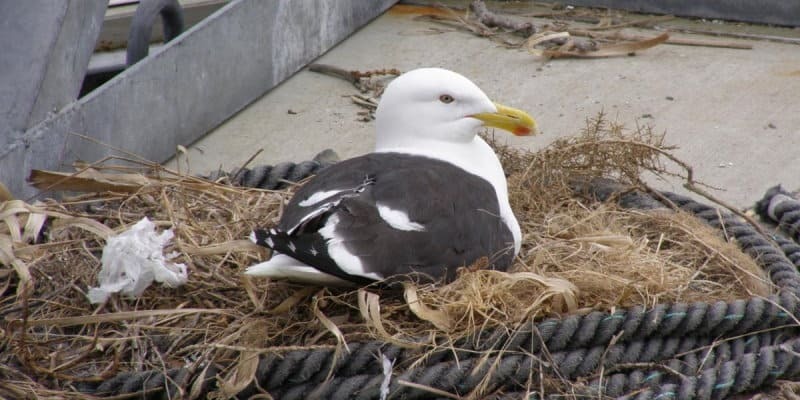 Gulls are highly persistent pests, but with the right approach they can be removed completely- so let us show you what a difference gull nest removal can make.